Evidence of water treatment has been found in ancient Greek and Sanskrit writings dating back to 2000 BC when boiling and physical filtration were the only methods known. At the time, water was only treated so it would taste better. Water safety did not become a concern until the 1670s when the invention of the microscope equipped scientists to view microorganisms in supposedly ‘clean’ water. By the 1700s, domestic filters made of wool, sponge, and charcoal were gaining popularity and the world’s first municipal water treatment facility, based on slow sand filtration, was built in Scotland in 1804. The filtered water was delivered by horse-drawn carts until water distribution pipes were installed three years later. The establishment of a water treatment facility confirms safe drinking water was becoming a priority to public officials. Water quality is an extremely hot topic these days. With continued population growth and strained water supplies it is likely to become even more so. It is estimated that already one in five homes have some type of water filtration or purification system installed. The bottled water industry is also experiencing a boom. Water quality concerns are probably a factor driving growth of rainwater harvesting as well. Drinking Water, Is it Safe? How safe is your water? The EPA regulates tap water, but how well do they do their job? In 2005, the Environmental Working Group (EWG), a non-profit, non-partisan organization made up of scientists, engineers, policy experts, and computer programmers dedicated to protecting human health and the environment, performed the first truly comprehensive study of drinking water in the United States. 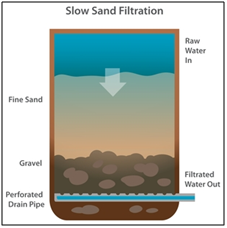 Filtration has long been an important technique in water treatment. It’s used to remove iron deposits from water, to clear up waters turbid from silt, inorganic sediments and biological materials, both living and decomposing. It’s a primary method of separating fluids from solids—and is often not well understood. In regulated municipal water systems, the U.S. EPA Surface Water Treatment Rule (2002) requires that a minimum disinfectant residual of 0.2 milligrams per liter (or parts per million) of free chlorine be present where the water enters the distribution system and that it be detectable throughout the distribution system. The role of disinfectants in protecting public water supplies is well documented and undisputed, but the reactions of some disinfectants with some natural materials in water and with other treatment chemicals, and the subsequent formation of unwanted by-products, are of concern. Risk to human health is not clearly documented, but experiments with laboratory animals do raise warning flags and numerous studies suggest the health risks of both chlorine and chlorine by-products to humans. Many rainwater harvesting systems used for drinking water rely on a combination of sediment filters, carbon filters and ultraviolet (UV) light to remove all unhealthy impurities and ensure the water is potable. This common water purification system has proven effective for decades; however, it is not equally effective in all systems. What constitutes sustainable or "green" technology in water purification systems? For a water treatment solution to be considered green, it must meet the criteria of not adding anything to the water and not using any additional water in the process. This article covers green technologies currently available and the contaminants for which green purification technologies are, and are not, an option. In the marketplace, there is an abundance of "greenwashing" of conventional technology and often a failure to disclose all the parameters of a purification system touted as being environmentally responsible. But just as conventional water purification is (or certainly should be) based on water chemistry, so is green technology in water purification. If you don't know what is in the water, you cannot possibly be successful in treatment. A number of factors combine to make ultraviolet radiation a superior means of water purification for rainwater harvesting systems. Ultraviolet radiation is capable of destroying bacteria, but UV does not actually destroy it. It inactivates the ability of bacteria to multiple. Additionally, ultraviolet radiation disinfects rapidly without the use of heat or chemical additives which may undesirably alter the composition of water.